School choice has been a flashpoint of education policy debate for decades. Supporters contend that choice lets parents find a school that meets their child’s needs, while pushing schools to innovate and improve through the force of competition. Opponents warn that choice drains resources from public schools and that market competition can be destructive. I observed some dynamics of choice in a recent study of eight elementary schools in the D.C. Public Schools (DCPS) system for the Office of the D.C. Auditor. Positive effects were evident, as principals, teachers and parents worked to upgrade academic and extra-curricular offerings. But choice also seemed likely to further weaken struggling schools because their human, financial and other resources are already falling short and the playing field is not level. Although school choice is often associated with government vouchers or tax credits for students to attend private schools, choice also occurs among public schools. School boards have expanded choice through magnet schools and open enrollment policies, while 42 states and the District of Columbia have authorized public charter schools which are operated independently. D.C. is a national leader in school choice. In 2016-17, only 24,000 of D.C.’s 90,000 public school students attended the school assigned to them by DCPS; the rest won slots in other DCPS schools or public charter schools (see table below). In addition, almost 1,200 D.C. students used federal vouchers for low-income families to attend private schools in 2016 and 2017. Because the DCPS system and individual charter schools receive most of their funding through a per-student funding formula (adjusted for students with disabilities, English language learners and other groups), competition has serious consequences for public schools in D.C. The following are some of the observations from the study of eight D.C. elementary schools. Hyde-Addison Elementary may have stayed viable by competing successfully, but also faced limits on its ability to compete. In 2016-17, only 171 children lived in Hyde-Addison’s attendance zone, but the school enrolled 329 students by recruiting almost 200 children from other neighborhoods. Still, Hyde-Addison was hampered by space constraints and the lack of a gym (now being addressed by a renovation), while its small size could not support an assistant principal or a full-time science teacher or psychologist. At Key Elementary, which boasted high test scores and enrolled 92 percent of in-boundary students in 2016-17, competition was almost irrelevant. Having exceeded its capacity of 360 students, Key had to add two trailers and could not offer preschool classes for three-year-olds (an offering at most DCPS elementary schools). Barnard Elementary also strained its capacity as enrollment grew from 482 in 2011-12 to 649 in 2016-2017, requiring the school to add trailers. More than half of Barnard students are deemed to be “at risk” of educational failure, and the school (home to a citywide autism program) also serves large numbers of special education and ELL students. Barnard’s challenge is to serve the high-risk children overflowing its roster, rather than to compete with other schools. 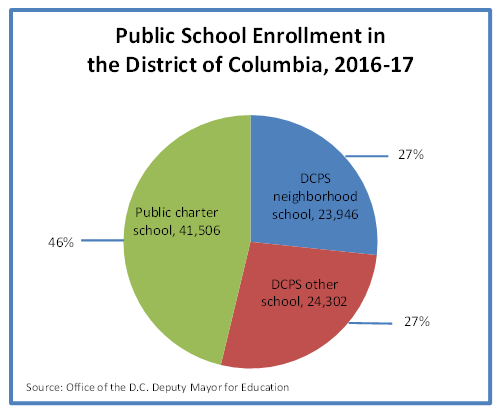 High enrollment also dilutes Barnard’s resources, because some staff allocations are fixed per school (each DCPS elementary school, for example, is allocated one principal, one instructional coach and one administrative aide). By contrast, Miner Elementary illustrates how schools losing enrollment in a competitive environment may stay in a rut. Miner’s enrollment dropped from 469 in 2011-12 to 384 in 2016-17, perhaps reflecting unstable leadership (four principals in six years) and low academic achievement. Nevertheless, Miner lost teaching positions as enrollment dropped, thereby raising class sizes and making the school less attractive. In addition, Miner is near many charter schools, which draw at least 200 students from Miner’s attendance zone. As a default assignment for some families who did not make (or have) any choices, Miner has a high-need student body, more than two-thirds of whom are deemed “at risk” and 16 percent of whom have a disability. In an online forum, parents have expressed unease about sending their children to Miner because it is a “low SES” school located near subsidized housing — a view that may further impede turnaround efforts. Noyes Elementary, which enrolled a paltry 197 students in 2016-17, faced a similar challenge in boosting enrollment, despite new offerings such as an extended-day program. At least 570 students from Noyes’ attendance zone attended 16 charter schools in 2016-17. Educating a high-need student population (70 percent deemed “at risk” and 21 percent needing special education), and plagued by low test scores, Noyes faces a difficult road to recovery. Choice can make schools more responsive and innovative, but the impact of choice may depend on existing resource levels (including parental support) that help schools compete effectively. Troubled neighborhood schools, in particular, may be difficult to retool in a competitive system—even after revamping leadership, staff, and curriculum—because they must serve all children who enroll instead of targeting particular market niches. Broadly applying a market analogy to education, a public good, can mislead because public education is mission-driven rather than profit-driven. Author: Jason Juffras ([email protected]) has 20 years of experience in public budgeting, policymaking, and program evaluation. He holds a doctorate in public policy and administration from The George Washington University. The views expressed in this article are solely those of the author, and should not be attributed to any organization with which he is affiliated.